Love is in the air this month. I’m stretching it out from one day to one month. Last year my son wanted to know why he had school on Valentine’s day, because what is more important than love? 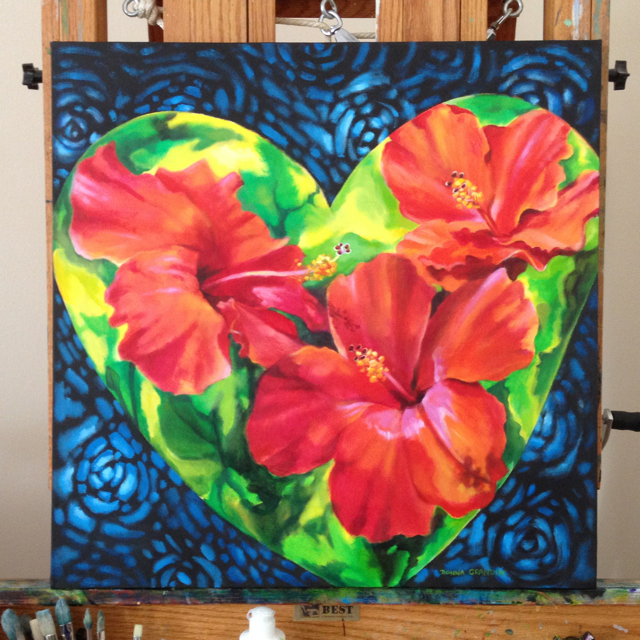 This is not exactly what I had in mind when I started the painting… initially I was going to use the red hibiscus for the colour and then a black & white Zentangle heart behind. However, while I have decades of acrylic painting behind me, I have zero experience doing Zentangles. If you don’t know what I’m talking about, it’s a sort of doodle, take a look here. You just might fall in love. If you have been following along, you may have noticed that last week I incorporated some doodling into my “Flights of fancy” painting. I am still at the stage where I can visualize something cool – using this new technique – but not quite manifest it. 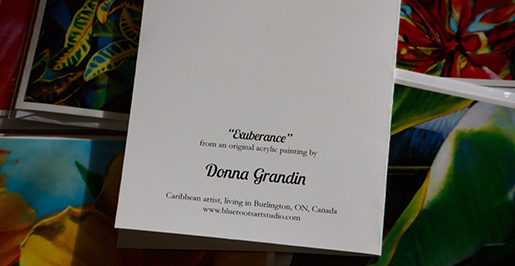 Right now I’m preoccupied with a couple of upcoming exhibitions (the St. Lucia Toronto Association Arts Showcase is in 2 days) and applications that are due soon, but hopefully by next week I’ll have some further progress to report. There is also an idea for a more serious body of work brewing, or maybe stewing, in the back of my mind. 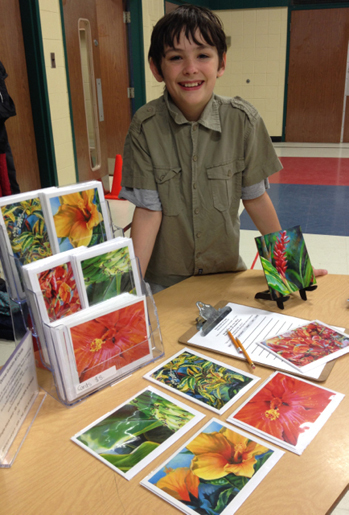 It revolves around my experience as a Third Culture Kid, so it is very personal to me, however each year our numbers increase and I like the idea of using my art to connect with others. I’ve been in flux for some time now, and I’m curious to see the effect of taking my creative process public. 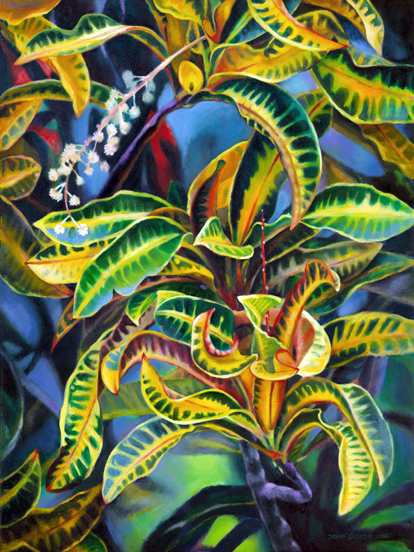 I enjoy painting foliage, and I have no intention of abandoning it, but this onion has many more layers. It is time to embrace the internet and push back at the old-fashioned “the butcher, the baker OR the candle-stick maker” mentality. It’s like I tell my kids, now you can be the butcher, the baker AND the candle-stick maker! In fact, we’re probably a generation behind the times, at this point it feels like you HAVE to be butcher, baker & candlestick maker (have you read or written a bio lately?). Artists have long had to wear several caps, but these days with the rise of Entrepreneurs, it is becoming the new “norm”. Ok, back to the painting, I actually painted my way through several variations which were equally interesting. I might go back & do a few more later. Or it might just be a stepping stone to the next plateau. Time will tell. Update: Someone bought this painting as a wedding gift, which I think is just perfect! 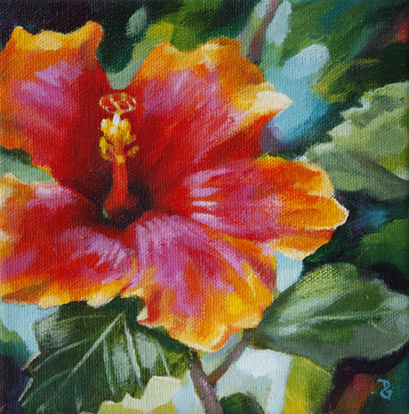 Flights of fancy, 8″x8″, acrylic on canvas, © 2014 Donna Grandin. So, I’m feeling kind of rebellious lately. It might be the February blues – I don’t know how much more of this d$#% snow and bitterly cold wind I can stand. I’ve already started an informal petition on Facebook to move Canada to somewhere warmer …. but the winter sports enthusiasts & kids are jamming up the works! 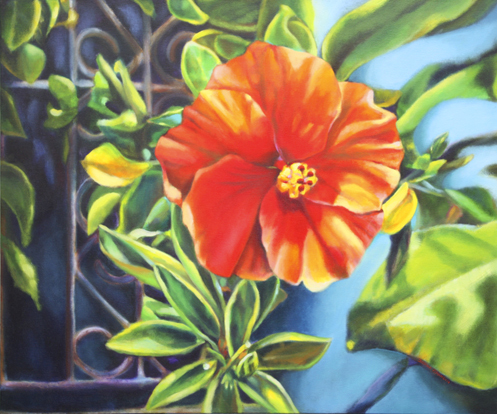 Or it could be because this week I had to turn down an opportunity for my art to be included in a book of 50 Canadian painters who paint flowers, because it would cost as much as a non-discounted flight to St. Lucia! 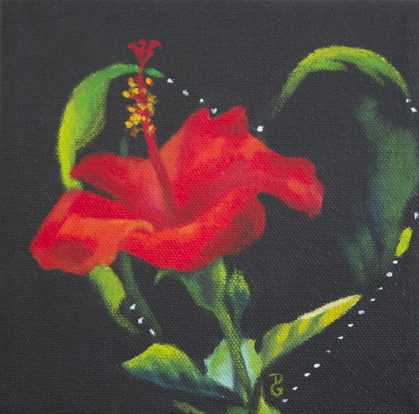 A little less than I made in art sales while painting my heart out last month during the 30 in 30 challenge. It probably does have something to do with hitting a milestone birthday in a few months. Anyway, the painting I was working on earlier this week turned out to be a very dark landscape, a gloomy reflection of my mood. Technically it has potential, but it just doesn’t feel like me. So last night I took it off the easel. Then at 11pm, when the last kid was asleep, I pulled out a fresh canvas. While I was reading to my kids, several old themes had mingled with influences from the week, coming together as an image in my mind. Then the image permutated into a possible series. I felt more excitement than I’d felt in weeks, so instead of heading to bed, I returned to the easel. The last time I glanced at the clock it was 3am, and I woke up this morning in my clothes from yesterday – not for the first time this year. From my bed, I could hear the reaction to the painting … “it’s a fish”, “Mom let her mind go wild last night”. Harrumph! Not what I was going for. 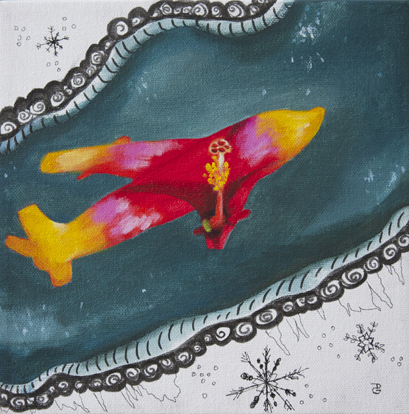 Though, when I took another look, there was no denying it looked like a fish, underwater. I was about to make a slight change that would have made it less fish-like, when I realized I liked that added dimension to the painting – the multiplicity of meaning. In fact, for now at least, I’m not even going to go into my own interpretation. I think as I do a few more of these, it’ll become obvious. Traditionally, an artist goes through the process of developing a series in the safety of their studio, occasionally seeking feedback from those whose opinions they trust. Then when the work is done, they edit out the dead-ends or out-right failures, select the best work to document and then promote through exhibitions or portfolio websites. A blog is a whole other beast. There is a beauty, and a danger, to making this creative process visible to anyone who chances on to your blog. Ultimately though, I think the benefits outweigh the drawbacks. 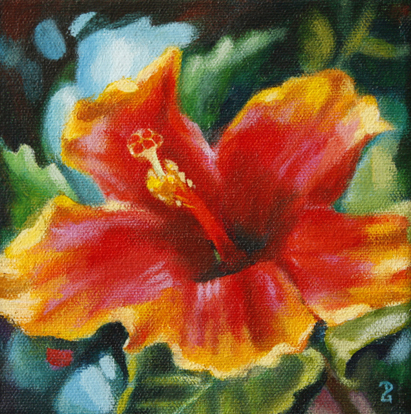 This is the 3rd Hibiscus gem painting out of three. I have to say my energy is flagging at this point. For those of you doing the 30 in 30 Challenge, how are you feeling now that we are almost 2/3 done? Has this been a good experience for you? One of the interesting things that has happened to me is that a number of my artist friends have written to say that they are inspired by what I’m doing. Three of them have even started their own individual challenge! Another positive is that a few people have said they’re glad to learn a little more about me as an artist, through my writing and through the new diversity in my subject matter this month. One down side was some negativity from a couple of artists – which I realize stems from their own unhappiness & desire to be doing what I’m doing. Don’t be fooled, every artist can think of other artists who they admire for their skill/projects/sales/connections or life circumstances which allow them more time to pursue their art professionally etc. etc. The key to getting out of this negative spiral is to change your attitude, accept that the other person has their own struggles, may even have had to make sacrifices that you wouldn’t even consider, and they are just on a different path. Life as an artist is a very individual path – it’s only when you make choices that are authentic to you that you are able to advance towards your own definition of success. So when you are having negative thoughts, before you lash out (even in a passive-aggressive way), look instead for the “take-away”, some insight that you can use to create positivity for yourself, and then take action. Of course the overwhelming response has been positive. I’m hearing from people who I didn’t even realize were following my art career, and several people have commented that the work I’ve done so far with this challenge shows dedication, focus, commitment. The funny thing is that the only reason they’re saying that is because they’re seeing a new, SMALL painting every day. 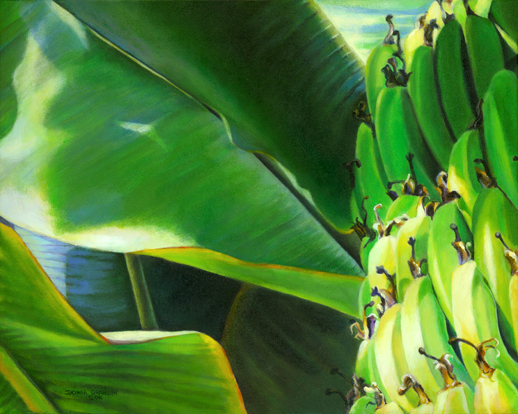 Usually I may take 2 weeks to do a large painting, or a week for a small one. And I put in nearly the SAME amount of time & effort! Normally I take my time to build up the painting in layers, reworking problem areas as many times as necessary. And instead of blogging, I’d be reading arts business articles, looking at inspiring art on the internet etc. I’m not going to list the myriad of actual tasks that come along with being a professional artist, but let’s just say that this year I want to do less thinking, research & planning (worrying, seeking “expert” opinions & procrastinating), and more following my intuition and creating my own projects, saying no to the ones that are offered to me but don’t advance my goals. 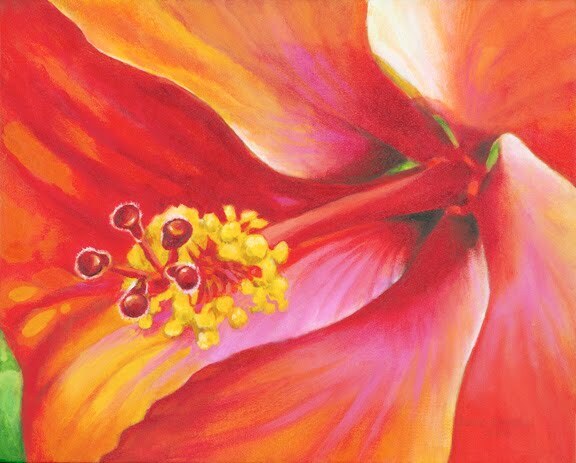 This is the second of 3 hibiscus paintings, they’re three different views of the same flower … oriented to the left, center and right. They could hang as a series, but of course it’s not necessary, they can also each go to a separate collector. 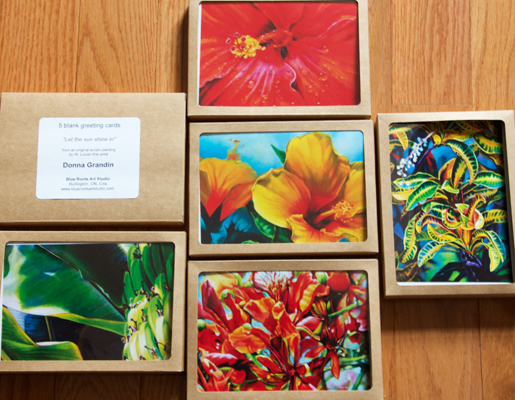 The 6″x6″ paintings also look really pretty on a simple picture stand on a table. 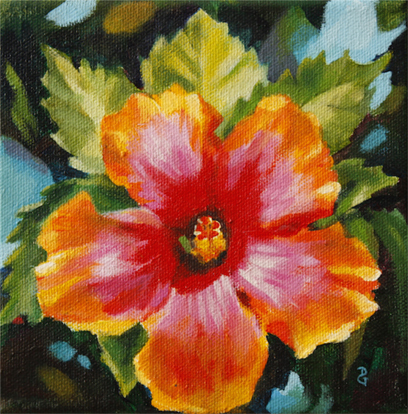 I like hibiscus because they’re open, bright and friendly, welcoming somehow. 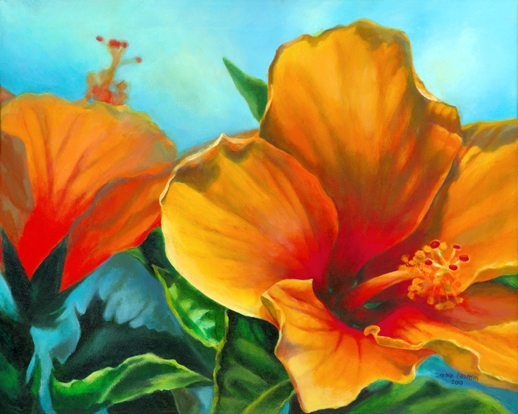 They do remind me of home, and a friend was just saying that they remind her of trips to Hawaii … I suppose they are reminiscent of any tropical location. Usually they bring back great memories for people … of relaxing vacations or exotic places, or just home. Just in time … here’s my painting for day 17. (I photographed it again in the morning in natural light, this is a more accurate photo than the one I included with the post last night). I was running late today for several reasons … so I did not start this painting till after dinner tonight. I hope to get back on track tomorrow. 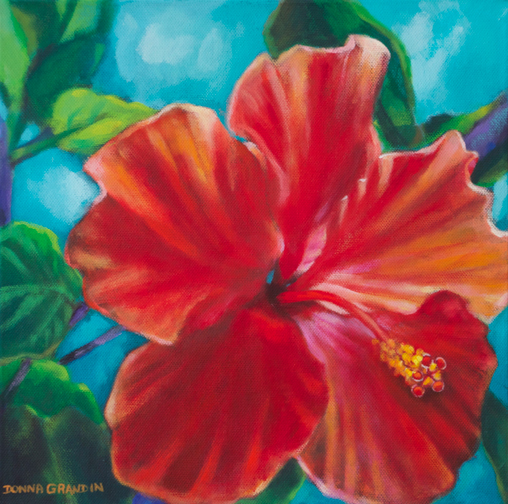 I chose a subject I’m quite familiar with … I’ve painted many a hibiscus before, but they’re all different. There are so many varieties left to do … this is a subject I come back to often. If you take a look at my Available & Portfolio pages you’ll see some of the ones I’ve done already. 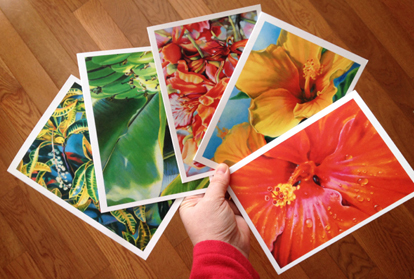 Most of them were photographed on the Caribbean island of St. Lucia, but they’re quite common here in Burlington too as houseplants, or outdoors in the summer. Today I sent out my first newsletter with Mailchimp. There are a lot of things I’d like to change before next month’s newsletter, but I’ve been promising to do this for a long time, and it was one of my January goals, so yay me! Also I had a lovely visit with a friend who I haven’t seen in years, but recently connected with on Facebook, when she came to pick up a painting – “Fast food”. It was perfect timing, the studio and surrounds really needed cleaning & I’ve been so focused on this challenge and juggling everything else in my life that I’d been putting it off for too long. I’ve always found that visitors are the best incentive for doing housework. Now I can probably make it through the second half of the challenge! 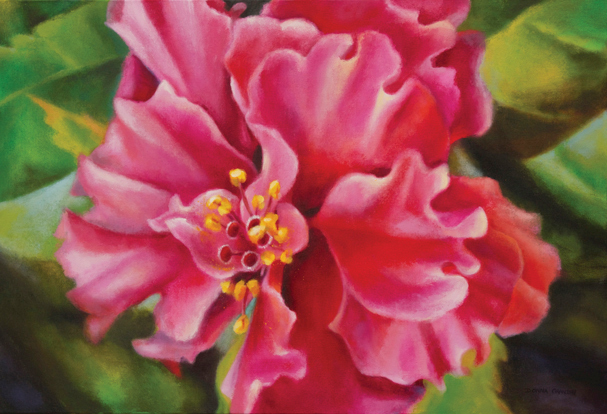 It’s an incredible feeling to get an e-mail from a gallery to say they’ve sold a painting WHILE you’re at the easel working on a new painting. I’ve been lucky enough to have that happen several times. However, the down side is that you don’t know who has bought the painting … though sometimes they’ll tell me which country it’s going to, or if it’s a couple, or a corporate gift etc. It feels good to know a little something, I’m not hugely sentimental, – as long as I have documentation of the work, I’m thrilled for someone else to take it home and pay for my supplies to work on the next painting – but it does give a little closure. However, my point was … I love it when I get to meet the collectors myself, it’s usually such a positive experience. And I love studio visits from collectors, other artists, dealers, journalists … ok, ANYONE who will let me talk about my art. I suppose that’s because it’s my passion, but on the other hand, I’m not exactly anti-social. And usually I’m equally as interested in finding out more about the other person. I would not do well as a hermit. That’s why my studio is completely open to my family, steps away from the kitchen or front door. If I need to concentrate, I put on headphones, but they always know where to find me. 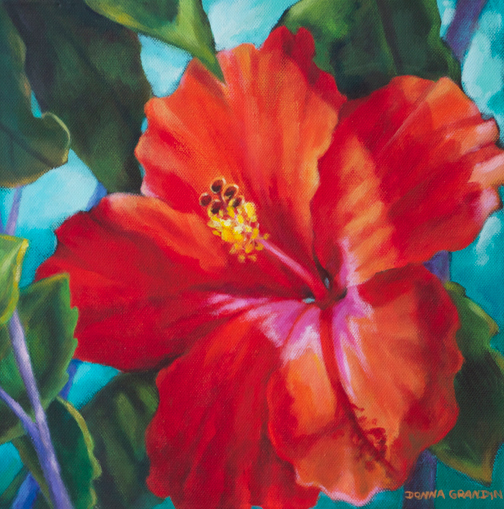 This painting, and two others by Donna, will be part of “St. 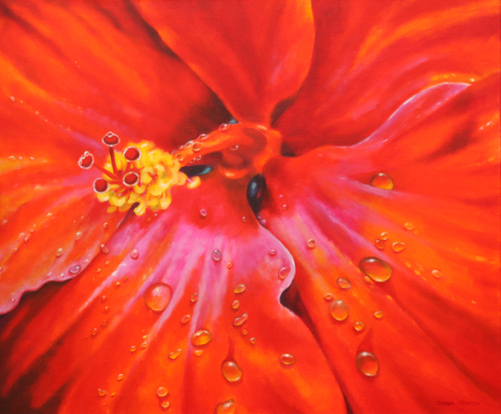 Lucian ART 2011: a selection of new and recent work by established, unknown and emerging artists from St. Lucia”. 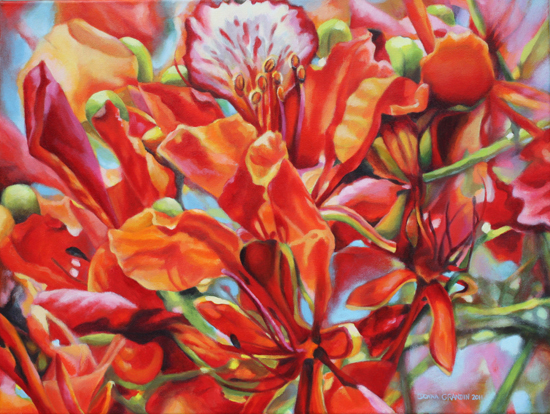 The group show opens Tues 25 January and runs till 5 February, 2011 at The Inner Gallery, Bois d’orange, St. Lucia.